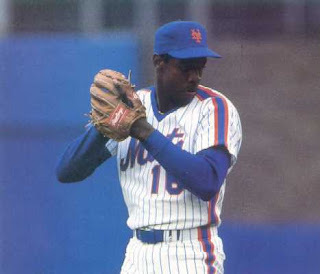 September 12, 1984: centerfield maz and a crowd of only 12,000 plus came to Shea Stadium to see Dwight Gooden break Herb Score's rookie record of 245 strikeouts in a season. Not only did the Doctor break the record but he struck out 16 Pirates along the way, throwing a five hit complete game shutout. Those were the days at Shea, when Dr. K would pitch with an electricity running throughout the ball park like a lightning storm. I can remember seeing the ball rise away from hitters and then hear the pop in the catchers glove all the way from my mezzanine seat. 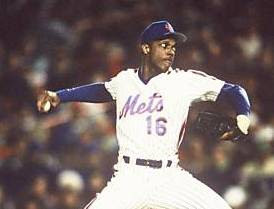 Gooden didn't walk anyone on this night, and his 16 strikeouts were the best of any pitcher in 1984. It was his 3rd shutout of the year,(4th in the NL) lowering his ERA to 2.72. He would finish second in the league with a 2.60 ERA in 1984, third with 17 wins and lead the league in strikeouts with 276. Goodens phenomenal rookie season earned him the Rookie of the Year Award as well. In tonight's game, Hubbie Brooks 16th HR of the season in the 4th inning off John Tudor was all the second place Mets needed for the win, 2-0. Pirates hitters; Tony Pena, Jim Morrison, Doug Frobel & Denny Gonzales all struck out three times each. Gooden struck out seven different batters in the line up at least once. My father and I were 2 of the 12000 in attendance that night. I was only 16 years old and, ironically, I received 2 free tickets for the contest that night from a winning Pepsi bottle cap I mailed in. I didn't know who Gooden was or how great he was, but I got my first lesson that night at Shea and had followed Gooden throughout his career from then on. I should have saved the ticket stubs. You were correct when you used the term "electric" when describing Gooden. I've never seen a fastball thrown so hard ever rise so much and combined with a devastating curveball. Dr. K was the master of the hill from 1984-1986. This coming from a lifelong AL NY fan. I lived in Forest Hills at the time and would often walk the 2 miles to Shea just to catch players in person after the game. Incidentally, Ron Darling often would take the 7 train from Willets Pt. after the game to his apt. in Manhattan in 1985.